We're living in a time of unparalleled Krispy Kreme saturation -- the beloved chain is celebrating the opening of its 1,000th store in Kansas City, KS tomorrow, and they're apparently bursting at the seams with donuts, because they're giving away 1,000 free glazed ones to the first 1,000 customers who line up at any of their stores across the country. So you're gonna have to be a bit of an early bird to catch this particular... uh, deal. There's no purchase necessary to claim your prize, so if you're OK with waking up at the crack of dawn (or earlier) to line up outside a donut shop that opens at 6am, this'll take care of your breakfast needs in one fell swoop. 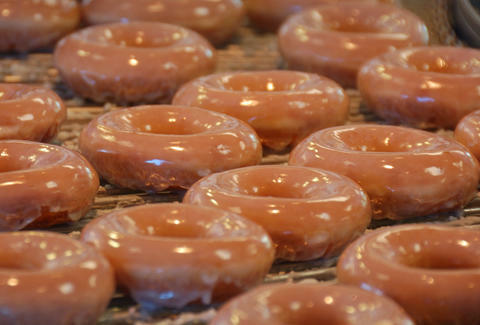 Of course, if you're fortunate enough to live in Kansas City, KS, they're giving away free glazed donuts for an entire year to the first 100 patrons in line. And with breakfast taken care of, the only decision you'll really have to make is whether to eat it as-is or turn it into a Sloppy Joe. Not so bad for a Tuesday morning. Adam Lapetina is a Food/Drink staff writer for Thrillist, and wishes he had the self-discipline to wake up that early. Read his musings at @adamlapetina.